A volume in Literacy, Language, and Learning Series Editor Patricia Ruggiano Schmidt, Le Moyne College Lack of knowledge about immigrant and minority students' learning outside school has contributed to the difficulties educators encounter when trying to embrace cultural diversity. Many educators do not have the knowledge base about immigrant and minority children's culturally-specific ways of learning in nonschool settings. Given the changing cultural landscapes in today's schools, we have an imperative to develop more situated understandings of immigrant and minority children's literacy learning experiences embedded in the social and cultural fabrics of their everyday lives outside school. This volume of research meets this important need in the field. It not only focuses on the complexity of literacy learning in diverse home contexts, but also examines how literacy is practiced and lived in multiple ways within families of various backgrounds including those of Asian, African and African-American, Hispanic, White European and mixed heritages. In addition, it explores how these various culturally embedded home practices will inform school education and policy making in a larger socio-political context. The book makes an original and significant contribution to the fields of literacy education and school, home, and community partnerships. 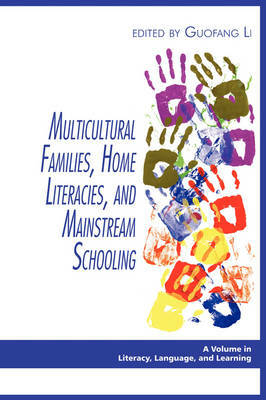 Since immigrant and minority families' literacy activities and the cultural contexts of their practices at home are not readily accessible to school personnel, program developers, policy makers or even researchers and educators, this book will serve as an important resource for teachers, practitioners, undergraduate and graduate students, teacher educators, and university researchers who are in the fields of literacy education, family literacy and new literacy studies, minority and/or immigrant education, and second language education.